If there was one state we were looking forward to the most, it was Colorado. And not just because it was a long slog across Kansas to get there. It was at the end of the yellow brick road for us. 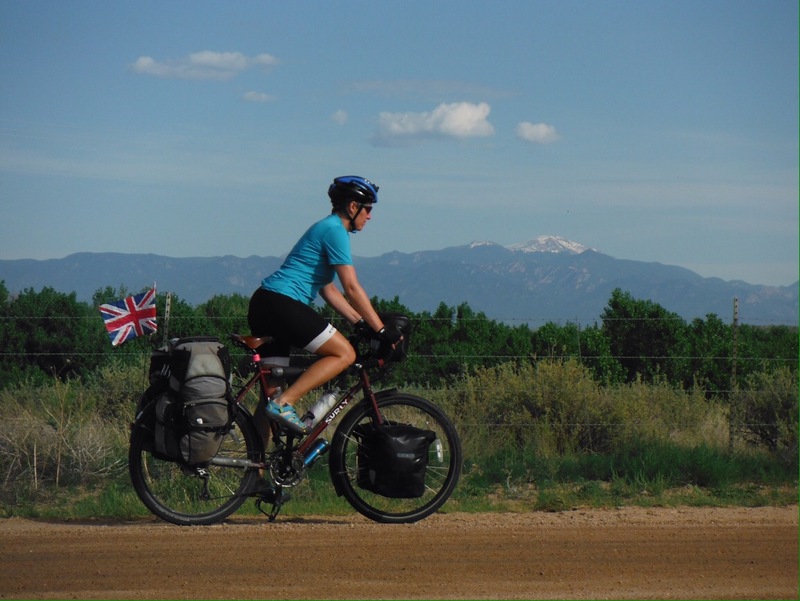 Filled with dreams of mountains and canyons we pedalled towards the border, where we were greeted with a sign that described Colorado as ‘colourful’. 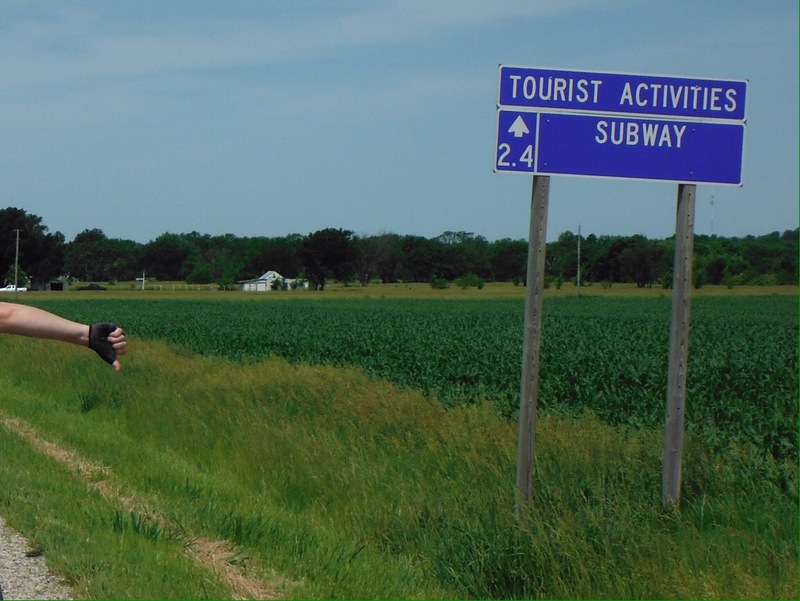 As we stood and ate a banana and looked beyond the sign, it seemed to be the same colour as Kansas. And just as flat. At our feet were empty bullet shells. Welcome to the Wild West! We had been told that Colorado doesn’t get interesting until you are halfway across, so weren’t expecting an instant change, but wow, this place is empty. 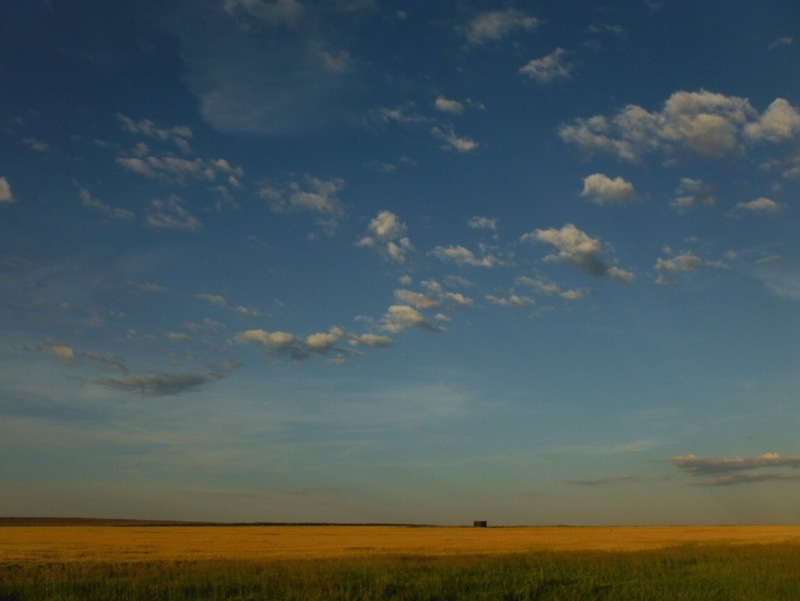 The farm buildings we had been seeing in Kansas dried up, and the landscape was now barely dotted with ranches. Only the entrances were visible from the road, so all we could see was lots and lots of nothing. More nothing than I had ever seen. And despite the promises at the border, it was even less colourful than Kansas as the green and yellow fields were replaced with lots and lots of greeny brown. I’m not sure brown counts as a colour. At least the sky was blue. The only thing of note when towns (a loose term here, more a collection of buildings) approached was how the huge old grain stores dominated the view. From a distance they look like castles or cathedrals, reminiscent of the approach to European cities. Then you get closer and they are just huge concrete structures. We took to measuring things by the side of the road, and passed an old train on a disused line that was over 3 miles long. Things are big out here to match the landscape. The first night in Colorado we camped in a town park, a little fearful of the storm clouds gathering overhead. Just as we were about to go to sleep the lightening started, and I have never seen anything like it before. The sky was lighting up in all directions, it was like watching a firework show. When the rain started and the thunder sounded closer we abandoned the tent to get under a shelter at the front of a disused building. British wimps. Eventually it looked like the storms had moved away so we ventured back to the tent only for the wind to pick up. The wimps then felt the need to go and check that there were no tornado warnings. There weren’t. Finally we got to sleep about midnight. Not ideal for our 5am start routine. After 100 miles of Colorado emptiness (that felt like 1000), mountains started to appear on the horizon. Finally! The road started to roll a bit. It was still another day before we reached a town of any size. Pueblo felt like a big city to us. There were fast food restaurants and everything. Unsurprising given the name, this was the place with the most Hispanic influence we have seen so far. Many Mexican restaurants, and public health signs in Spanish (drink less juice, more water – our Spanish is really coming on). It seemed like a pretty nice town to explore, and we arrived around 3pm, but we were so tired that the only thing we wanted to do with our spare few hours was sleep. So we did. Maybe next time, Pueblo. 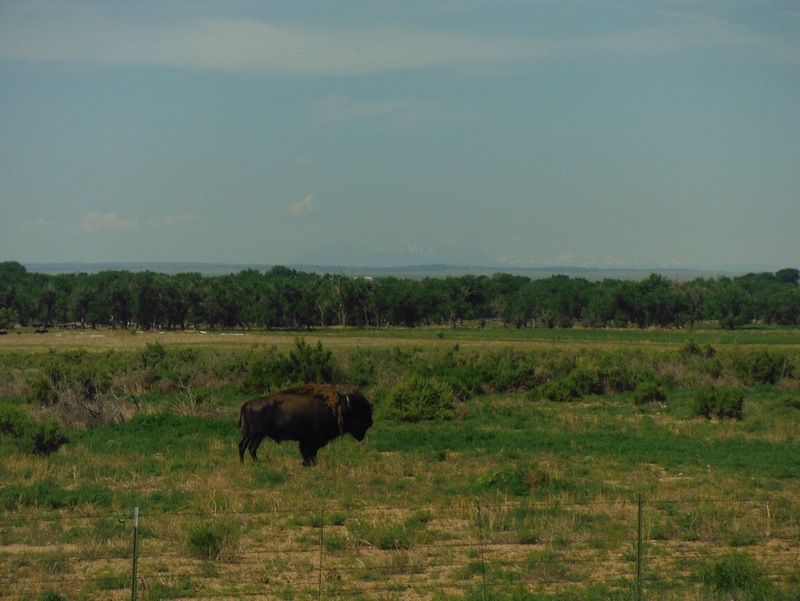 Since we left St Louis we have been focussing on reaching Evergreen, a town just West of Denver and the home of two people we had never met before but were expecting us to pay a visit. As we got closer to this magical, mythical place where we could take a day off, the tiredness became overwhelming. 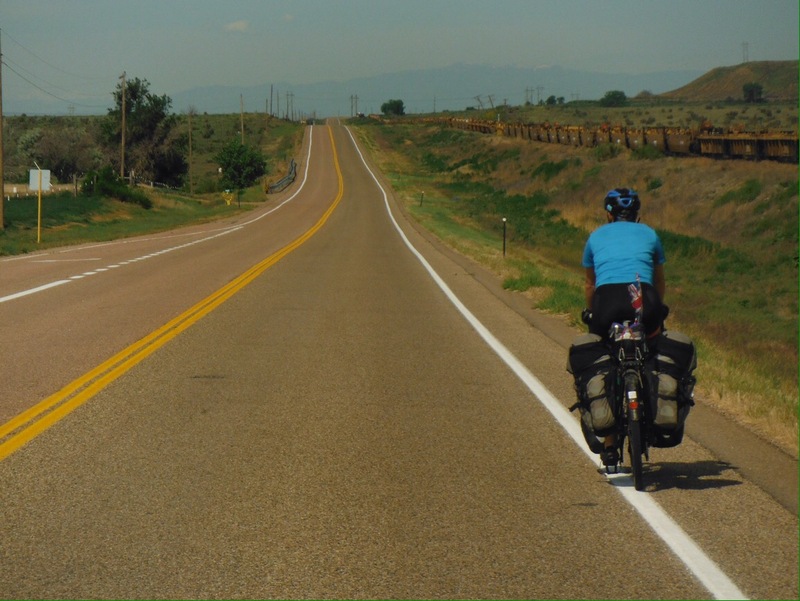 The penultimate day took us to Colorado Springs, a town full of cyclists where no less than 5 people came up to us to ask if we had a place to stay that night (and a sixth offered to buy some margheritas). It pained us to turn down all offers. The friendliness of folk is quite overwhelming sometimes. 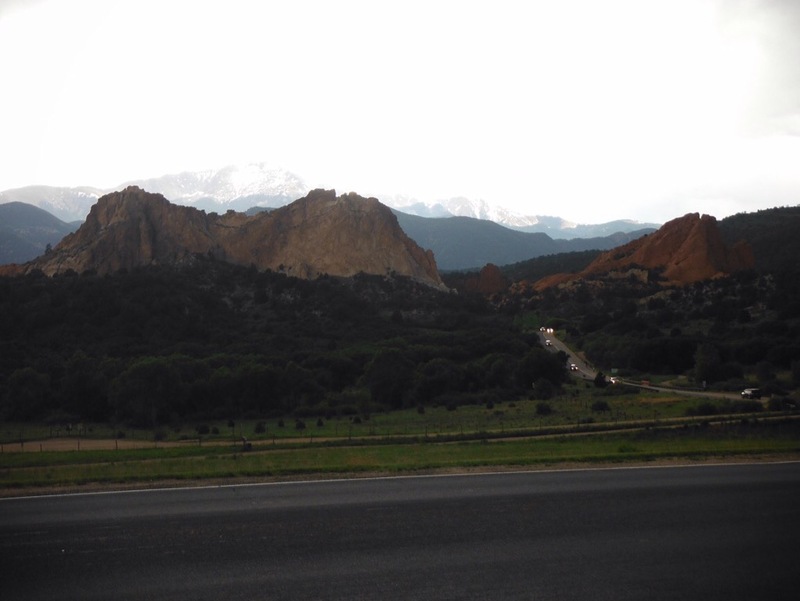 It is also home to Garden of the Gods, a huge area of giant red rock formations that you can drive or ride a loop around. Despite almost falling asleep whilst having a late lunch in an air-conditioned taco place we wanted to pay the rocks a visit so reluctantly got back on the bikes and rode uphill for 6 miles into a strong wind to get there. Grey clouds loomed ahead and we hoped to get to the visitor centre before they decided to empty themselves. We made it with minutes to spare and sat undercover enjoying a tuna sandwich and the view of the rocks knowing there was no chance of us being able to ride around. But at least they looked nice, especially with the 14000ft Pikes Peak behind. During a break in the rain we pedalled madly back to town whilst lightening cracked all around us. The storms out here are crazy. And scary from a bike seat. Day 15 of riding in a row was the most testing. I thought if I closed my eyes I could actually fall asleep while cycling. Luckily, riding with mountains all around was exciting enough to keep my eyes open. But it got us to Evergreen and our vacation destination with people we had never met before but in traditional American style treated us like long lost friends. Three days off in an amazing house up in the mountains was just what we needed. Even if we got up at 6am on the first of these to go white water rafting. 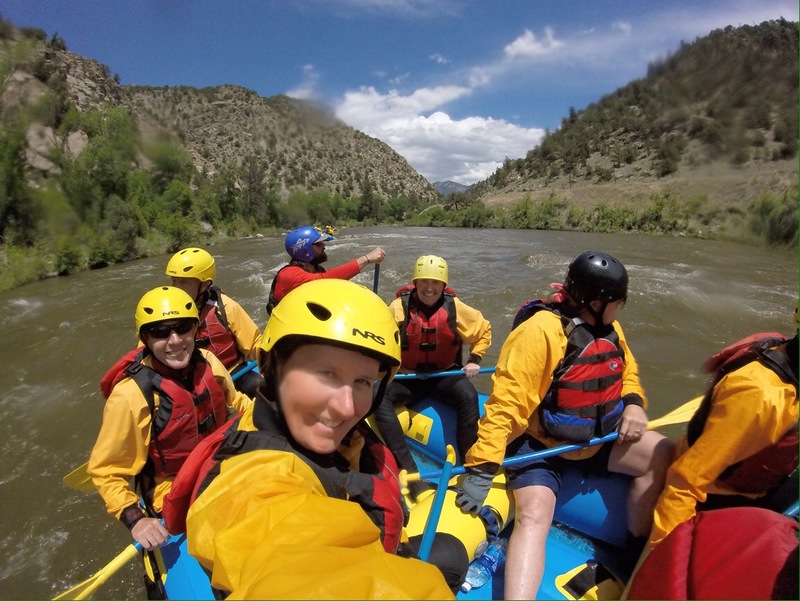 This was incredible, rafting through a beautiful canyon with snowy mountains all around. The Arkansas river is pretty high right now so some of the rapids were a little sketchy and the 5 degrees Celsius water was refreshing to say the least. Colorado is beautiful. 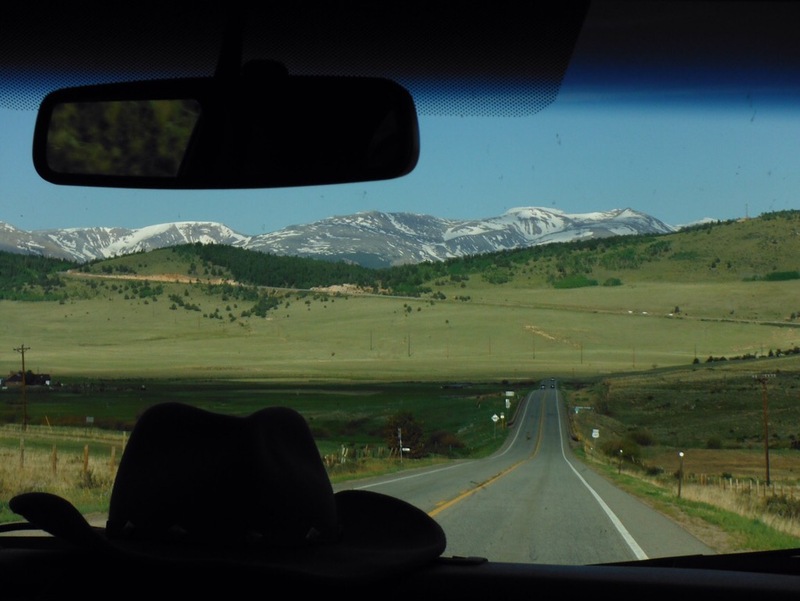 We also got driven through a stretch of the state that we wouldn’t have seen otherwise – including South Park (yes where the tv show is set). From here things are going to get interesting. We are into bear territory. There is a huge mountain range to cross. The plan is to ride through Rocky Mountain National Park on the highest paved through road in the USA. 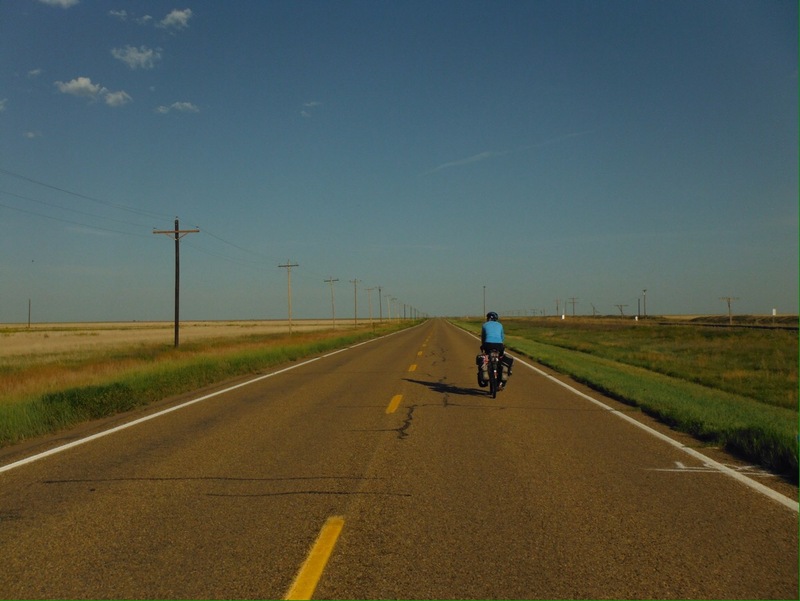 I’m sure weeks of flat riding through Kansas (actually I don’t think we have ridden up a hill since Vermont) is perfect preparation for this…. 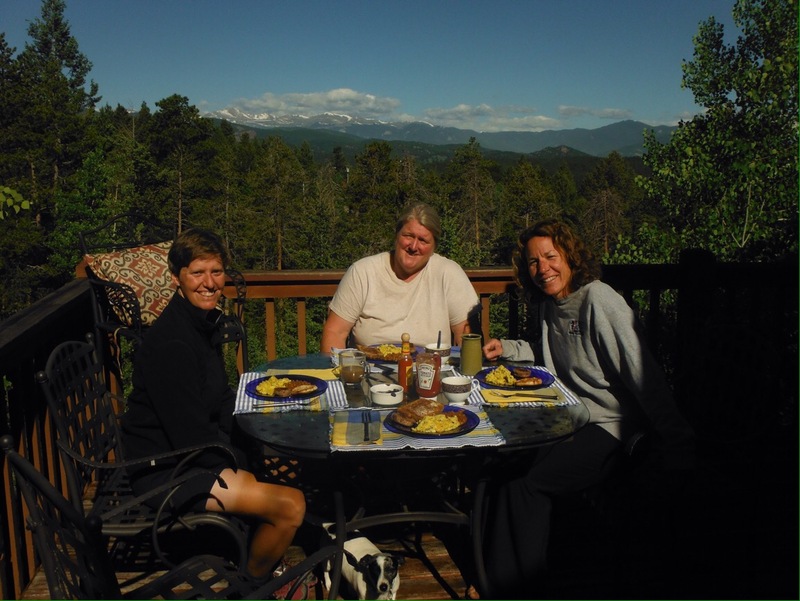 Big thanks to Gillian in Ordway; Martha in Colorado Springs (and everyone else who offered help); and of course Sue and Lesli (and the Austin crew) for an amazing break at the high altitude mountain getaway. 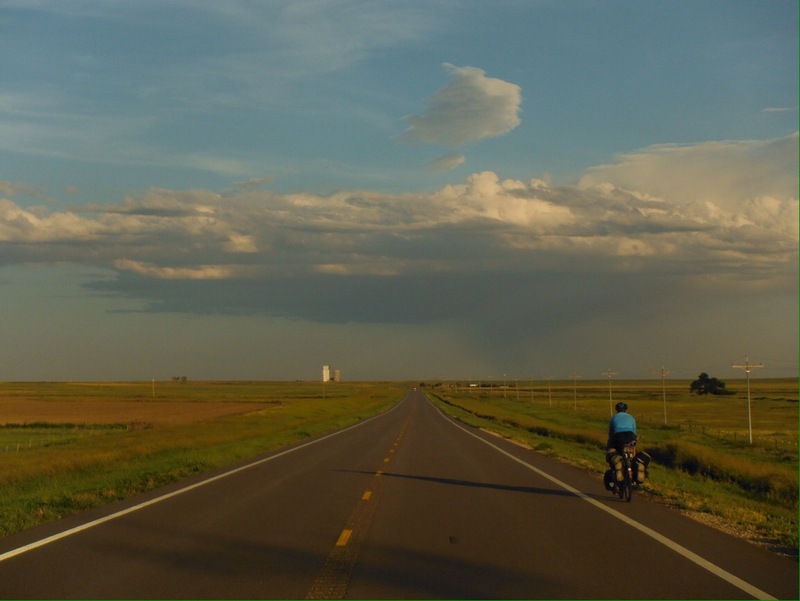 How interesting is it to ride a bike across Kansas? You decide…. Kansas. The state everyone wanted to tell us about when we talked about our ride West. Boring. Cornfields. Flat. Windy. Empty. Mind-numbing. None of which filled us with excitement. But could it really be that bad? It would be almost 500 miles from East to West. We hoped not. 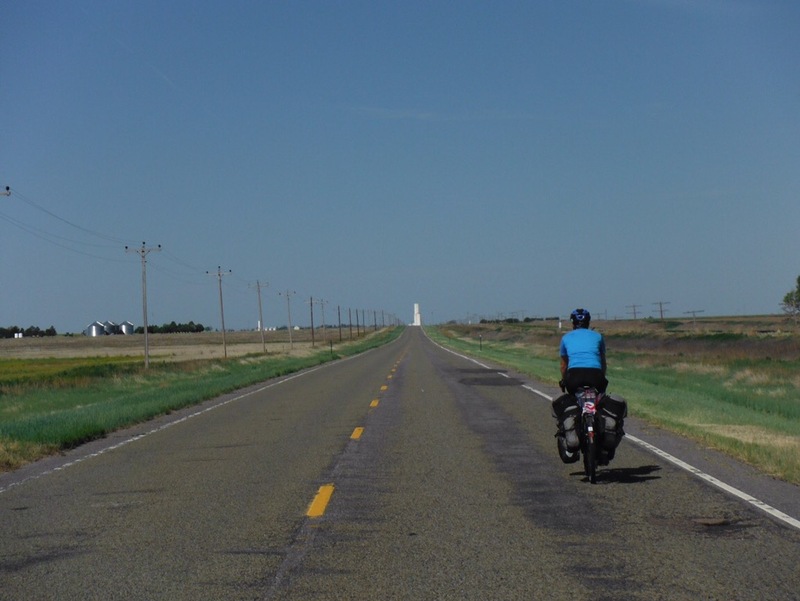 Writing this in retrospect, reading this blog post may be similar to riding across Kansas. Starts off well, creating some optimism, but soon fizzles out. Once finished you are filled with the satisfaction of sticking it out until the end. Then you might look back fondly and hope in time you remember the good bits, but you know you won’t be repeating it in a hurry. 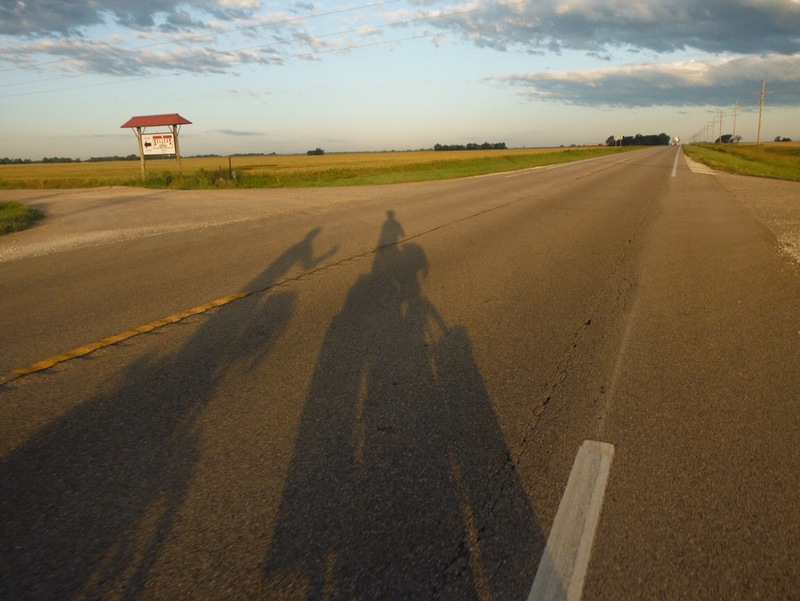 A mile into day 1 we crossed the imaginary line that is the state border without even a welcome sign, and were pleasantly surprised that the land didn’t instantly flatten out, turn yellow with corn and the wind didn’t smash us in the face. So far so good Kansas. 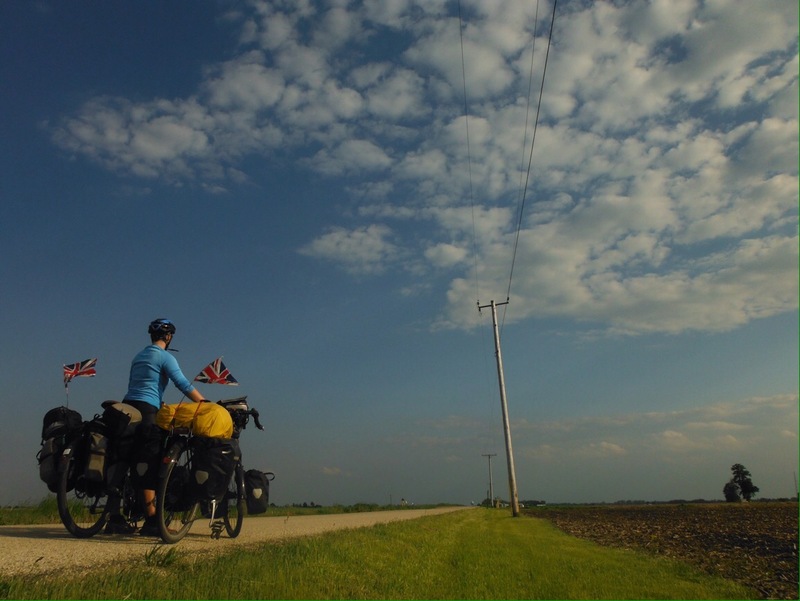 For the first few days the land rolled nicely, everything was green, we rode through the Flint Hills area and visited the Prarie Tallgrass Reserve (where we were disappointed to find only regular height grass, apparently it isn’t tall until the end of the summer). 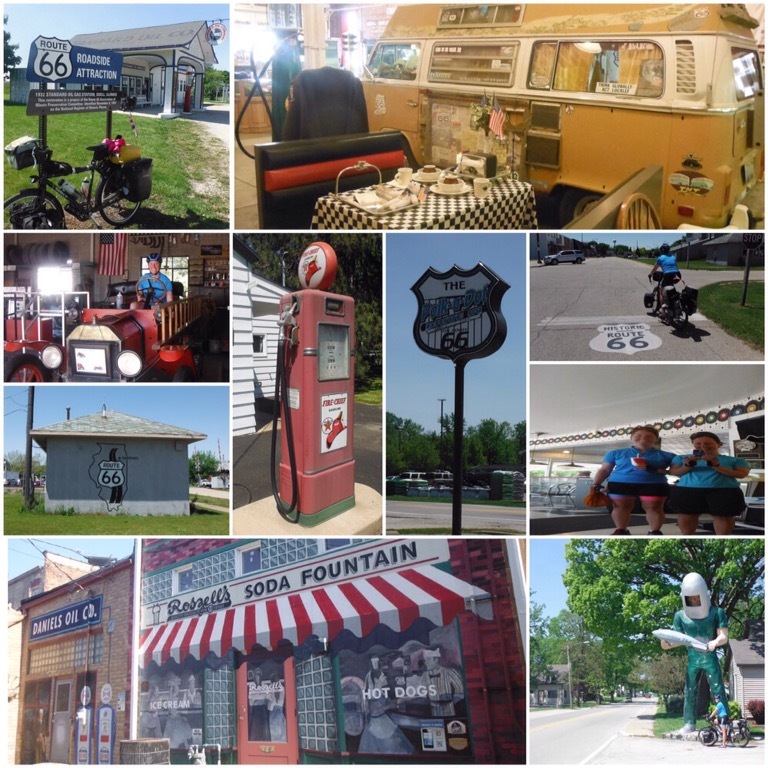 Towns were evenly spread and felt welcoming; we stayed in Council Grove and Hillsboro, both nice, small places full of friendly people. Council Grove had a load of historical sites to visit and Hillsboro, a college town, had a nice feel and lots going on (the first thing that happened to us in town was a guy shouted out of his car window that we should go to the farmers market for dinner, so we did, then as soon as we sat down a family came over to chat to us and bought us food). We were finding interesting tourist attractions. Though Kansas needs to work better at selling them. Was all the negative talk an elaborate ruse by those within the state to keep tourist numbers down? 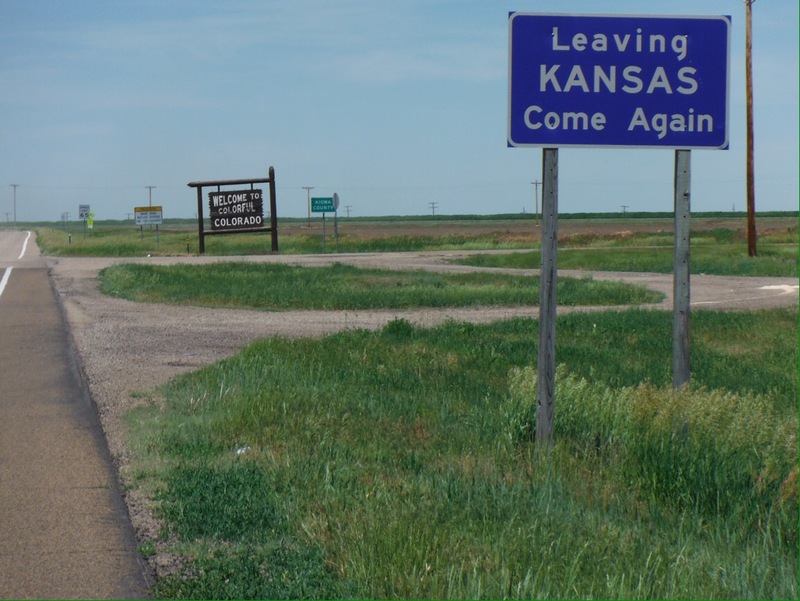 Would we get to the Western border full of enthusiasm for Kansas and be hauled into a room, be forced to sign the official secrets act and promise to tell everyone that Kansas is dull, flat and empty? This wasn’t helped by the fact that every town we went through – this even started in Missouri – people would say “oh it really opens out now, there’s nothing West of here, it’s just empty”. And then it wasn’t. Until it was. 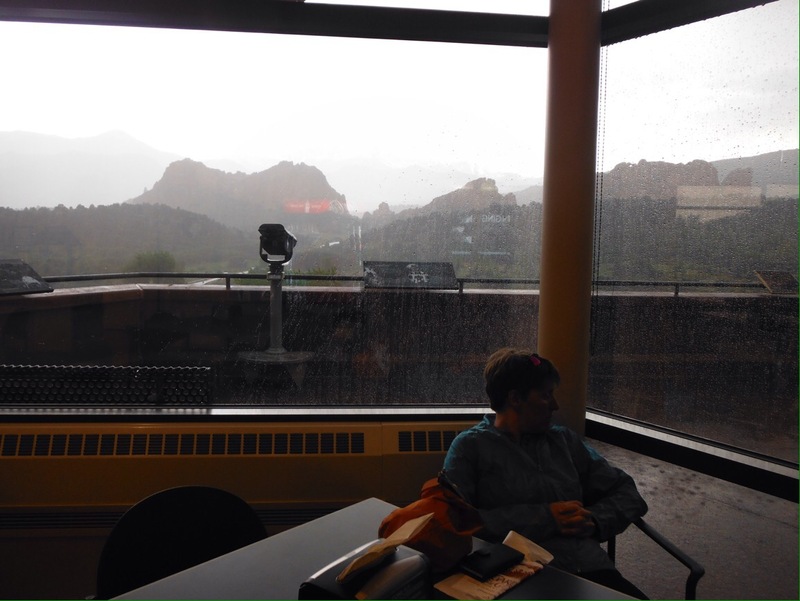 We were invited in to the conference room of the McPherson visitor centre for an air-conditioned lunch, to be told “oh it really opens out now, there’s nothing West of here, it’s just empty”. And finally they were right. The road was also busy, and the combination of big fast trucks and wind made it the most unpleasant stretch so far in the USA. A truck passing on the other side feels like a slap in the face – you brace yourself for it and a second later it hits, causing a big wobble. In the same direction, the force is like a huge slap on the back, and sometimes so powerful it lifted my shirt up at the back. So finally we had the long empty vistas that we had been expecting. The towns dwindled and became less interesting and more buildings became derelict. Farmland ruled. We saw more signs for churches than we did for towns. The wind picked up and it got hotter. We had been told that to beat this, it is best to get on the road before 6am. Reluctantly this became our routine, only for it to be roasting by 12 noon with us miles from our intended destination. We spent the evenings trying to get to sleep in a pool of sweat. But it was still not empty. Farm buildings were regular enough and close enough to the road that we were confident of finding shelter if storms came over. The scenery didn’t change much but there is a certain beauty in open space. And the early morning starts provided colour. Life on a bike was still good. – We stayed in a motel for the first time. And the second time. 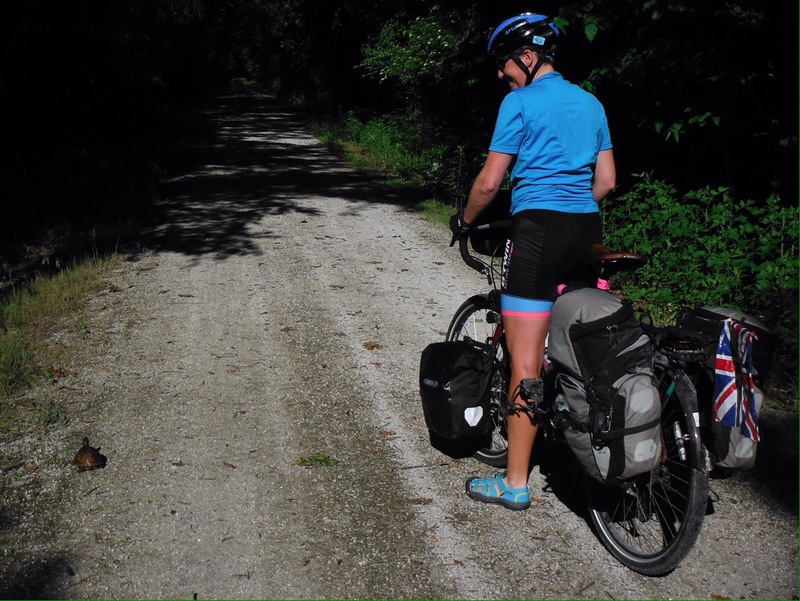 – After the wildlife extravaganza on the Katy Trail we were back to dodging dead animals in the shoulder, including armadillos. Still not seen a live one, but they are pretty big. – In a town called Lyons, their baseball team is called Lyons Lions. Come on. – People actually greet you by saying “howdy”. I enjoyed this. – We stayed in a house that had been built by a guy especially for his wedding, with a great curved staircase in the centre of the room for her to walk down. They are now divorced. But the house is still cool. 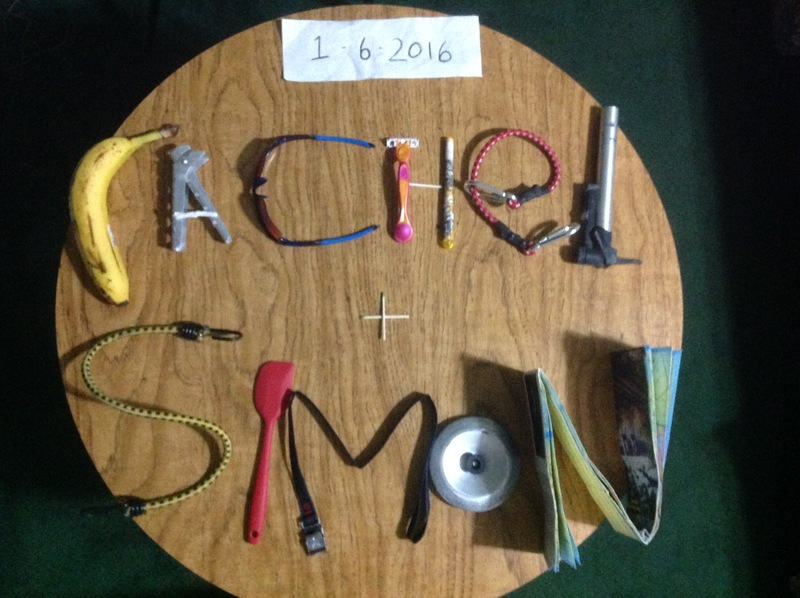 – One day I realised our bike pump was missing half of it. Despite (or maybe because) of only having one puncture in the first 7000 miles of the trip I was convinced we would get one before we reached the next town big enough to have a pump (40 miles). We did not. – Whilst camping in Lyons I got 25 mosquito bites on my back through my t-shirt. Why did nobody mention mosquitos when they talk about Kansas? – I fell down some stairs in a house and my head broke my fall. How I did not hurt myself seriously I do not know. But I was grateful that I didn’t. In the middle of all of this my younger sister got married back in England. I got up at 4.30am to Skype home before the ceremony and see her in her dress, feeling very far away. Wedding thoughts occupied my mind through the open scenery for the whole day, wondering what was happening back home at particular times, sad to be missing the day. The following morning I looked through the photos and was suddenly filled with overwhelming sadness at missing such an important day for my family. For the first couple of hours that day I couldn’t stop the tears from flowing. It’s easy to forget that by taking trips like this, we miss things back home – not always as important as a wedding but snippets of a life that is going on without us. This is tough sometimes. But life on the bike went on. Kansas went on. 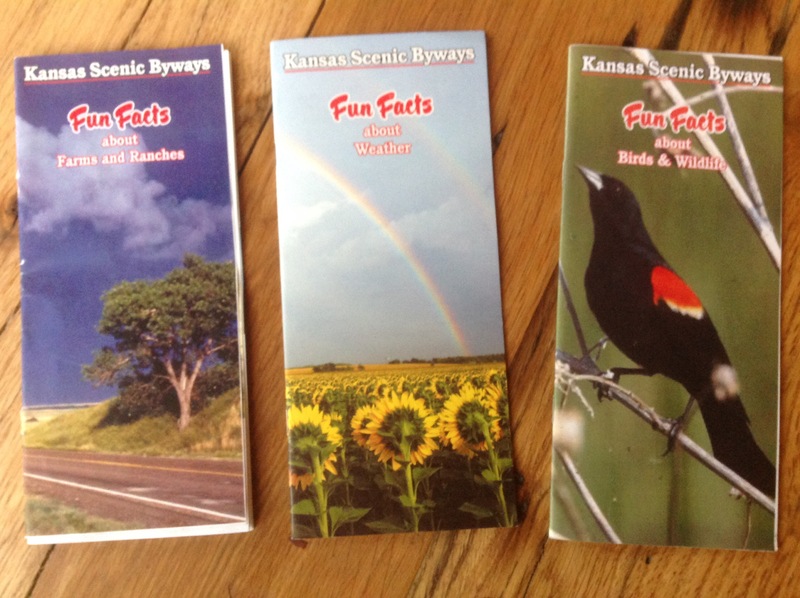 One day I entertained us by reading from a “fun facts about farms and ranches” leaflet we had picked up (part of a Kansas scenic byways fun facts series). The road was so quiet I could ride and read. We learnt some interesting facts about cattle, and some less interesting facts about fence posts. This killed about 5 miles. Small towns were very proud of their school achievements, and we looked forward to reading about these which were always advertised on entering the town. 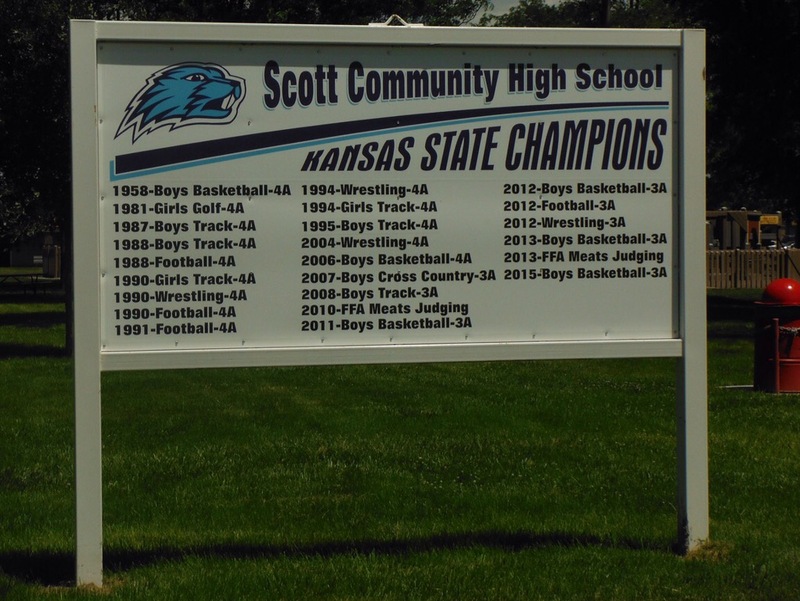 The High School in Scott City had an illustrious history; we were particularly impressed by their 2010 achievement (to be repeated in 2013). *Spoiler alert. This did not happen. Thanks to: the staff at Knights Inn Ottawa for getting up with me at 4.30am to make sure I could Skype home; Paul and Sharon; Del, Debbie and Alison and the farmers market crew; the McPherson visitor centre staff; Sarah. 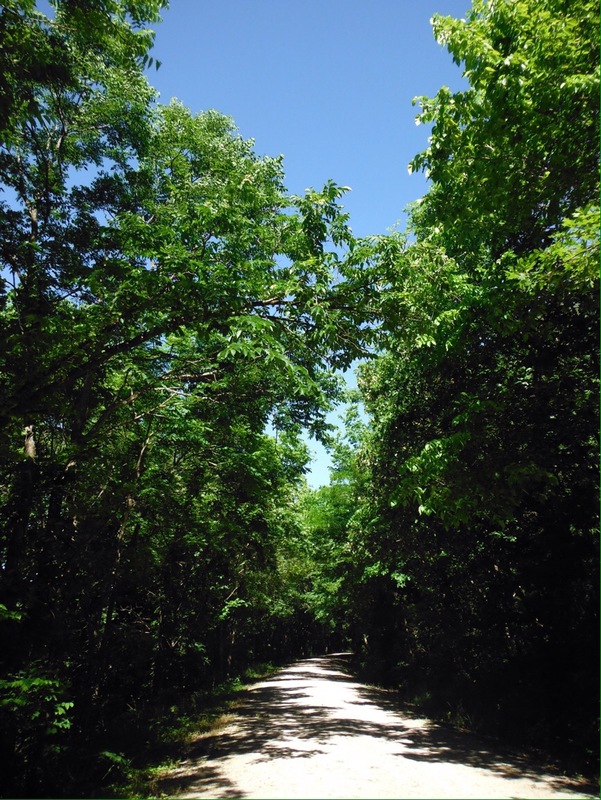 Along the route of an old train line, the Katy Trail is the longest rails-to-trails bike route in the USA. 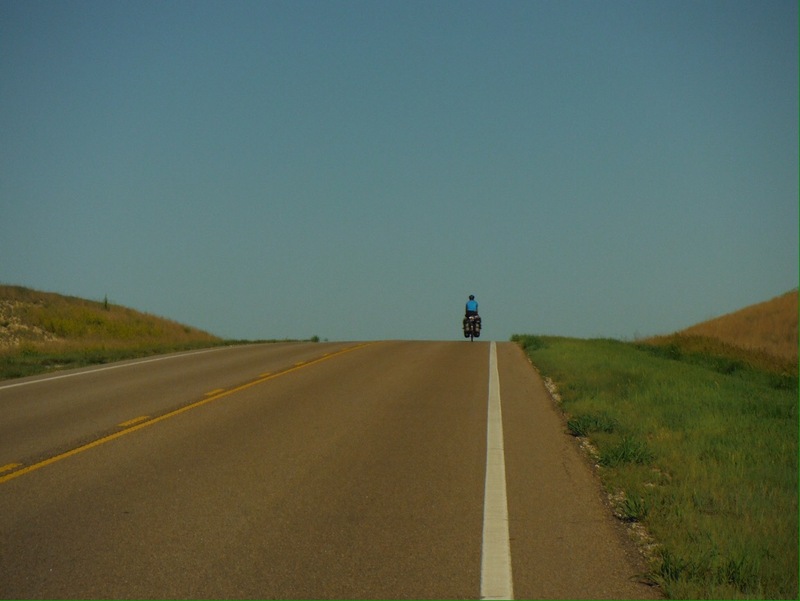 It was a big change from riding Route 66. Less cars, burgers and neon, more trees and wildlife. I had an important internal radio change, Chuck Berry to the Blues Brothers. Both great songs that became a little annoying after a couple of days. 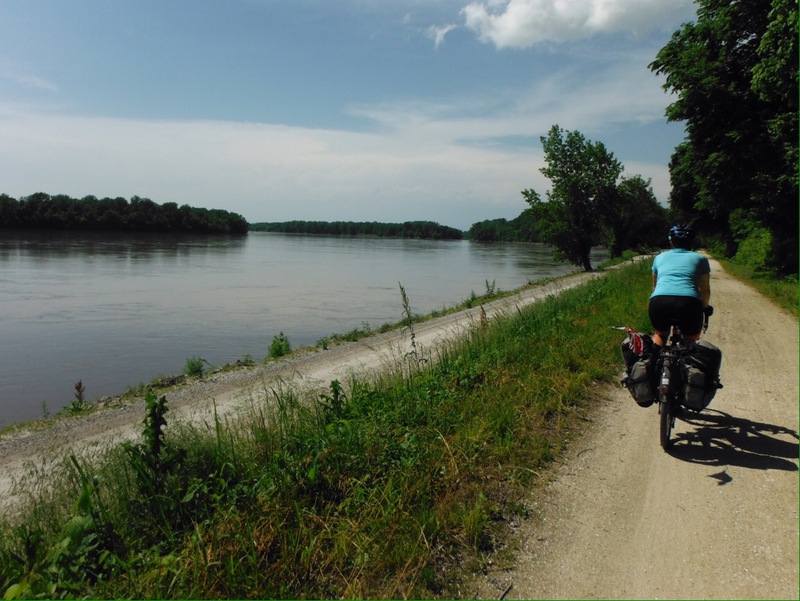 Having visited the Lewis and Clark Centre on the banks of the Mississippi we would now be following the intrepid duo as their Corps of Discovery journeyed up the Missouri River. Commissioned by President Thomas Jefferson, Lewis was selected to lead the expedition to find navigable trade routes through the West. He in turn recruited William Clark and the two led a band of merry men on a testing two year trip to the Pacific and back. Similarly intrepid, on the first afternoon on our well-surfaced and fit-for-purpose bike path, I scared myself by riding over a snake assuming it to be a stick. It was black and over a metre long. 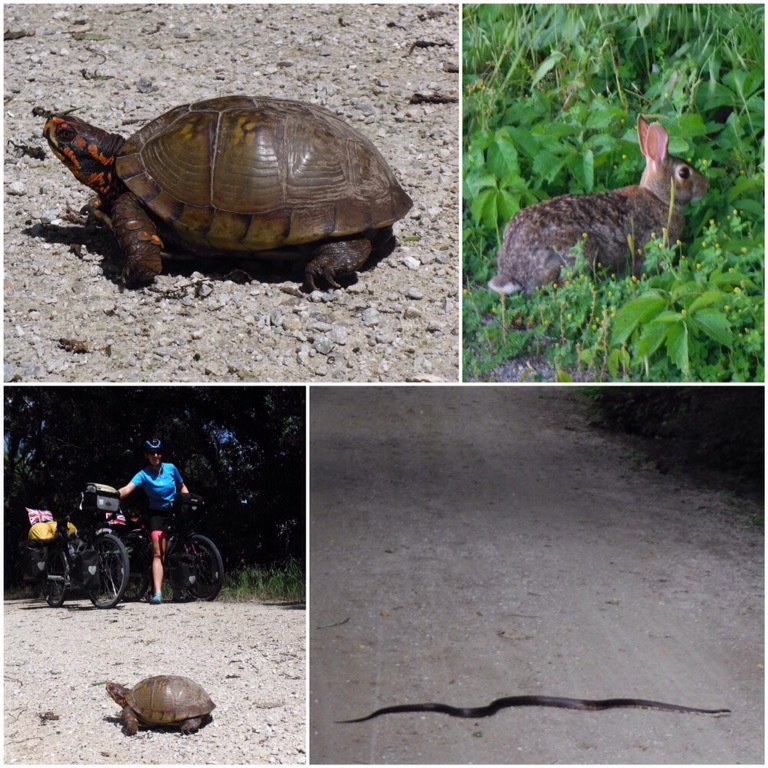 We would meet a lot of wildlife on the trail, especially where it was sandwiched between bluffs and the huge Missouri River. 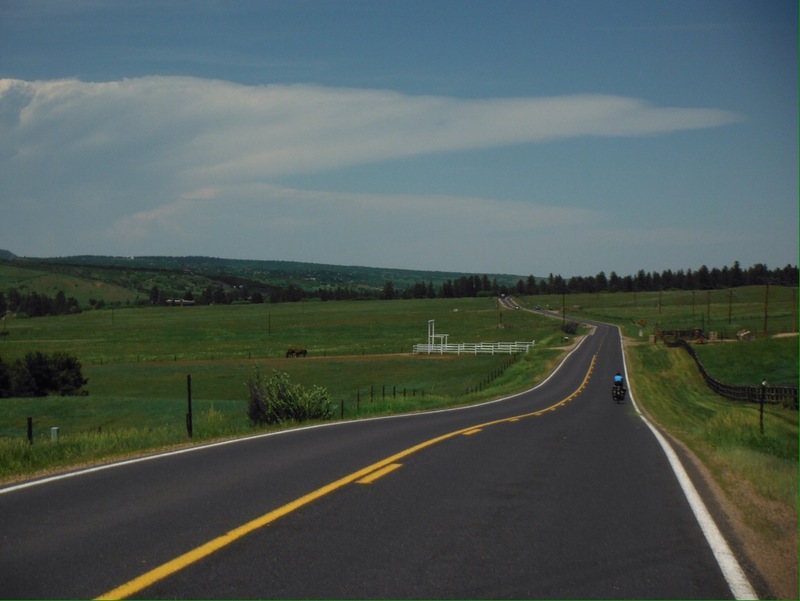 It was mostly scenic, mostly flat and has plenty of accommodation options so makes a great trip should you be in the area with a bike. We camped at a ball park and watched some intensely supported softball, and loved the Turner Shelter in Tebbetts. 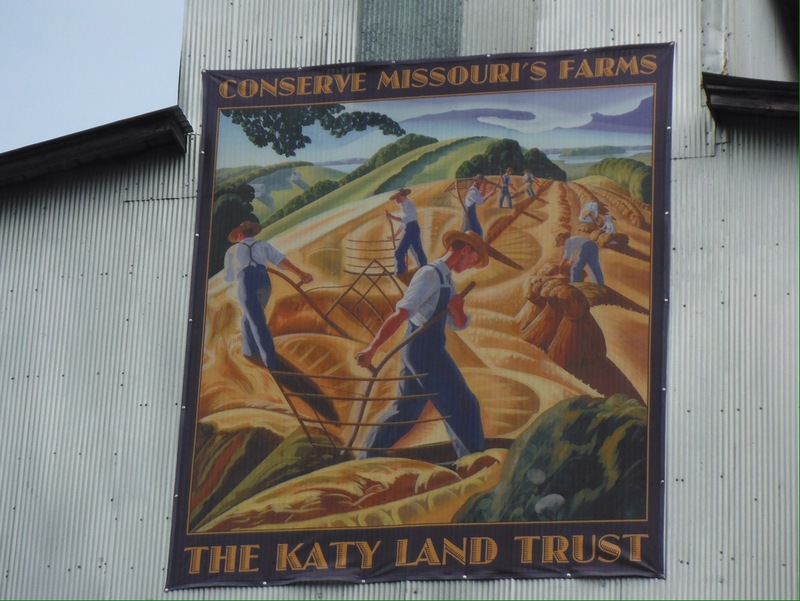 The snake incident inspired the invention of a new on-the-road game and there were information boards every 10-15 miles, so the Katy Trail kept our interest for it’s 240 mile length. Wildlife on the trail. Yes I know there are rabbits everywhere but everything else moved too quick for a photo! 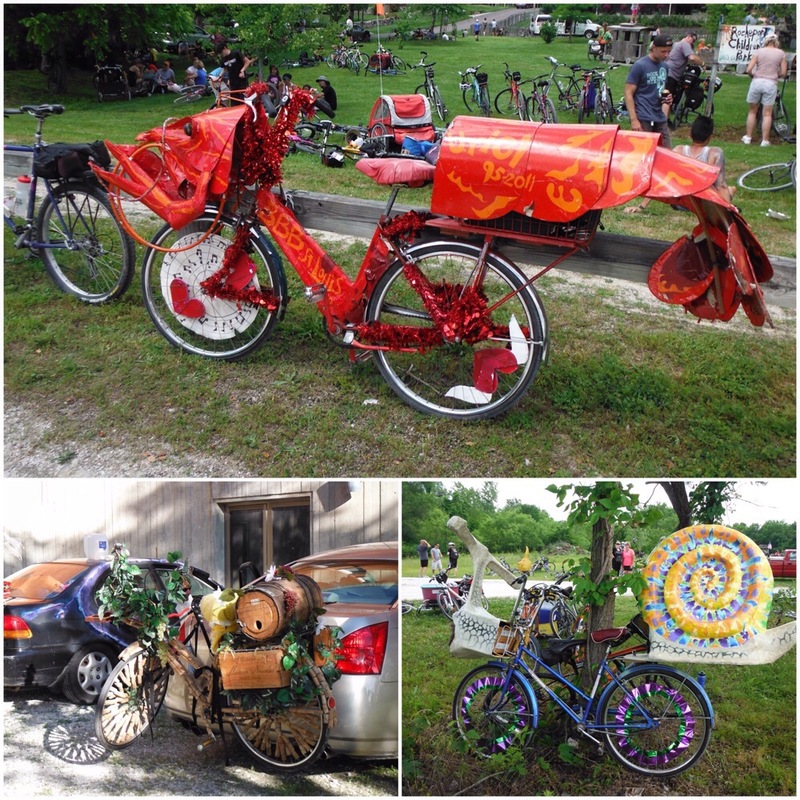 A fun day off in Columbia meant that one of our days in Missouri coincided with the eclectic Pedaller’s Jamboree, a cycling and music festival that moves along a thirty mile stretch of the trail. Invited to join some locals for the day, we shared the path with 3000 cyclists, including any number of tandems, papier maîche animal-ed bikes and inventive ways to carry beer. 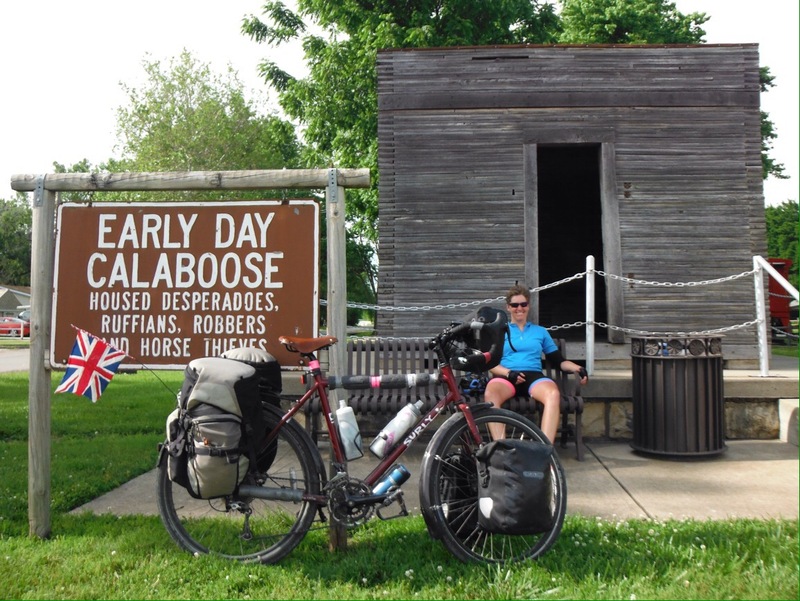 As the cycling got more wayward and the falls more frequent we left the revellers and continued west, arriving to camp in a small and seemingly deserted town. At the park we met English cyclist Nigel, and found out why the town was empty. Everyone was at either a 60th wedding anniversary or a birthday party, or it might have been a 60th birthday and a wedding party, both of which were in earshot of the park. The birthday wrapped up early, but the wedding celebrations carried on into the car park courtesy of car radios, and eventually (worryingly) drove away. So Jo and Nigel told me. I was asleep. Sunday was the least scenic and most hilly trail day, but the turtles, frogs and snakes still kept us on our toes. They were also some great stories on the info boards, including some underhand tactics by the the Katy builders to win the race to Indian territory against a rival railroad. They employed spies and disrupted the others progress by a number of methods. The best of these was sending an ‘official’ stocked with drink supplies to tell the rivals crews their construction was complete and it was time to party. The aftermath of the celebrations cost several days work time and the Katy company took the lead and the right to build the railroad through the territory. 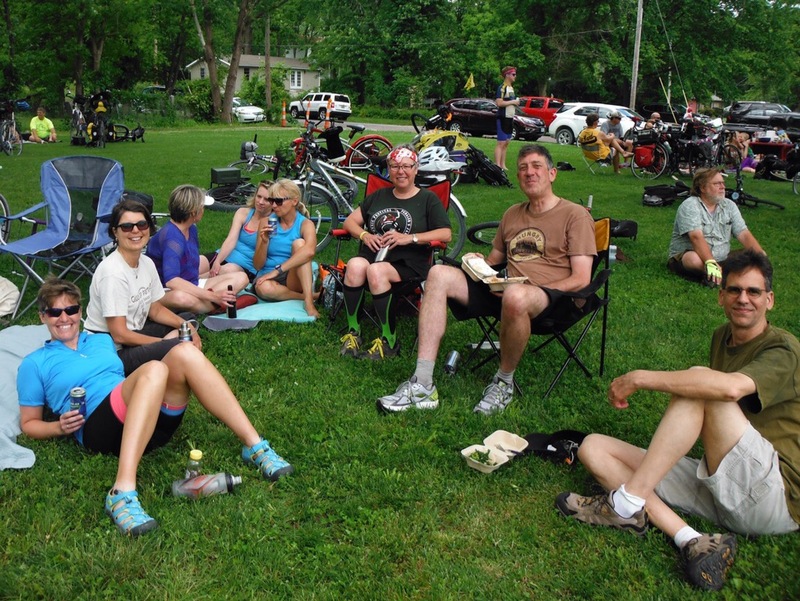 We didn’t have a party, but we did eat a lot of pasta at the end of the trail in Clinton. Our final day in Missouri was the seemingly mythical Memorial Day. Since we have been in the USA people have kept telling us that things (attractions/campsites/shops/roads) will be open after Memorial Day. It was finally here and everything was closed for it. Alanis would see the irony I’m sure. It was a beautiful day of rolling hills, swamps, rivers and only two scary storms to hide from. We enjoyed some great company and pork chops in the evening. 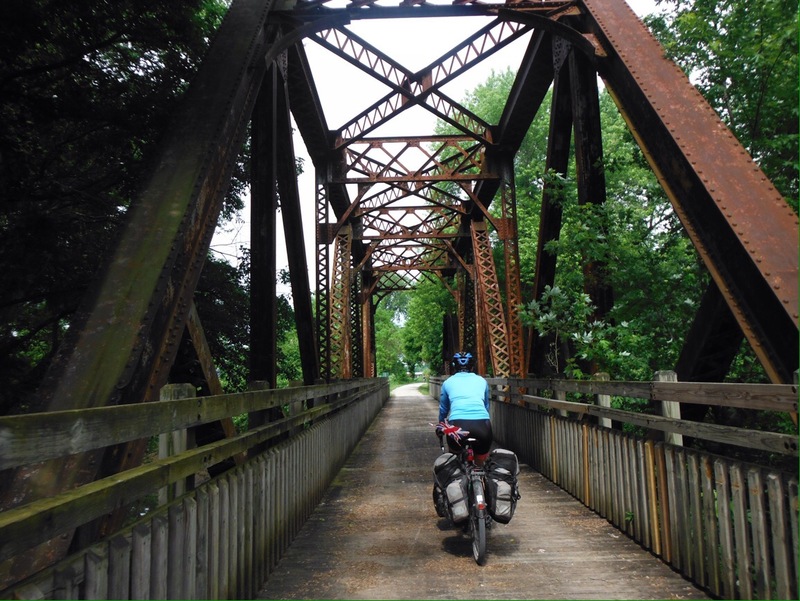 From the Museum that wasn’t to a bike party day via a wildlife-d trail Missouri was a lot of fun. 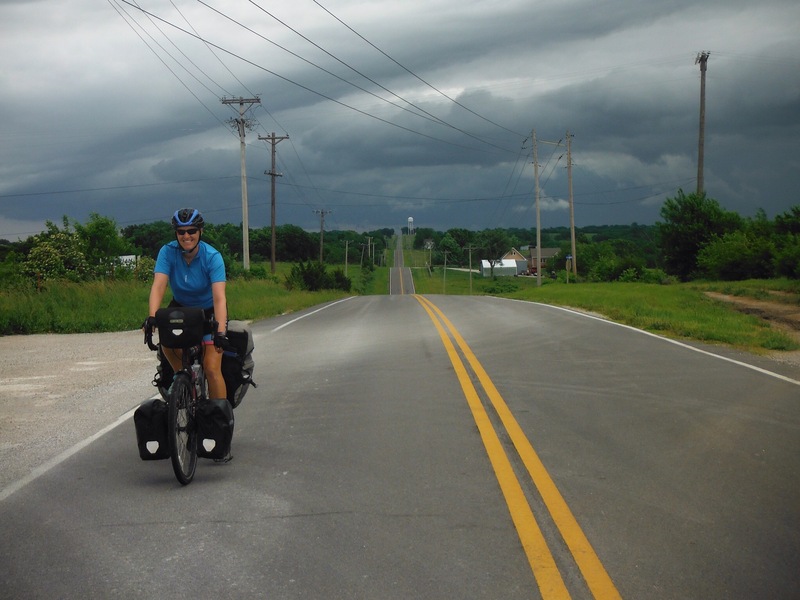 A sign told us that we had entered Tornado Alley and we hoped to avoid a trip to Oz as we continued West and into Kansas. Thanks to: The Turner Shelter, Adrienne, Adam, Loki & everyone, Ian, Ellen and the Jamboree crew, Kelly and Delora. Everyone should drive on Route 66 at some point in their life. You don’t need to take it the whole way from Chicago to LA to get a flavour of its iconic status and enjoy the touristy fun. Especially if you love 50s kitsch, burgers and ice cream, giant statues and bumpy roads. The route is crammed full of things to stop and look at, some good, some not so good, some bizarre. 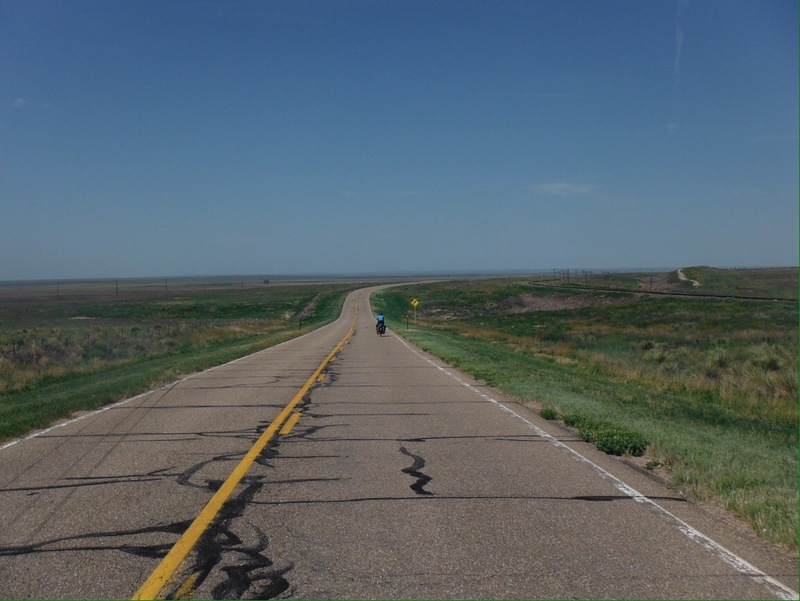 Even four days by bike is enough to see why so many people flock to the USA to drive on a route that doesn’t really even exist anymore. 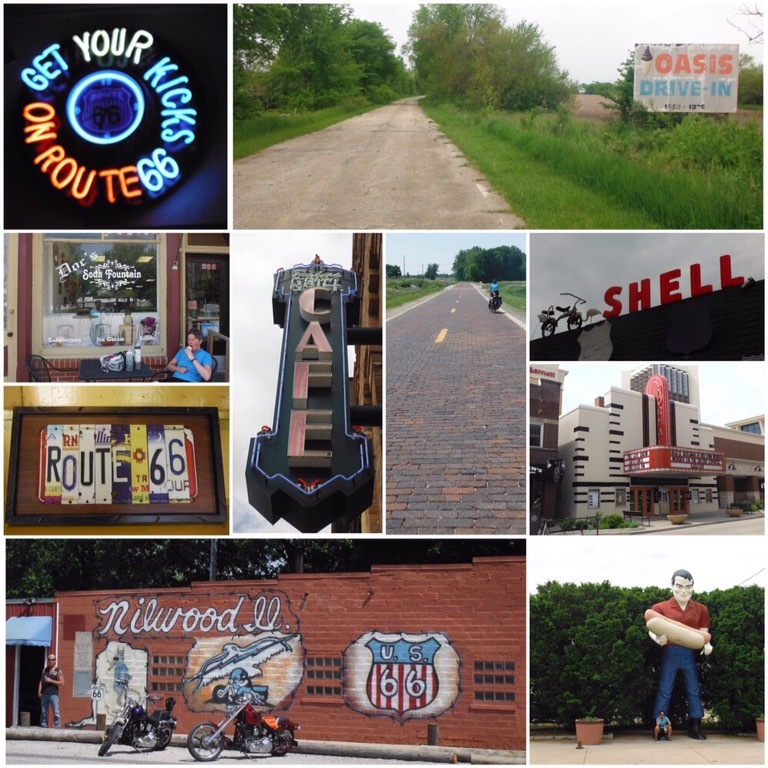 We didn’t start in Chicago – riding through miles of city suburbs isn’t that appealing – so joined “historic Route 66” as it is officially called just south of the city. This day marked quite a change in the trip, as it was the first time we had ridden for a whole day on busier roads. Straight away the noise of the interstate that runs alongside the route was noticeable after being accustomed to peaceful bike paths. 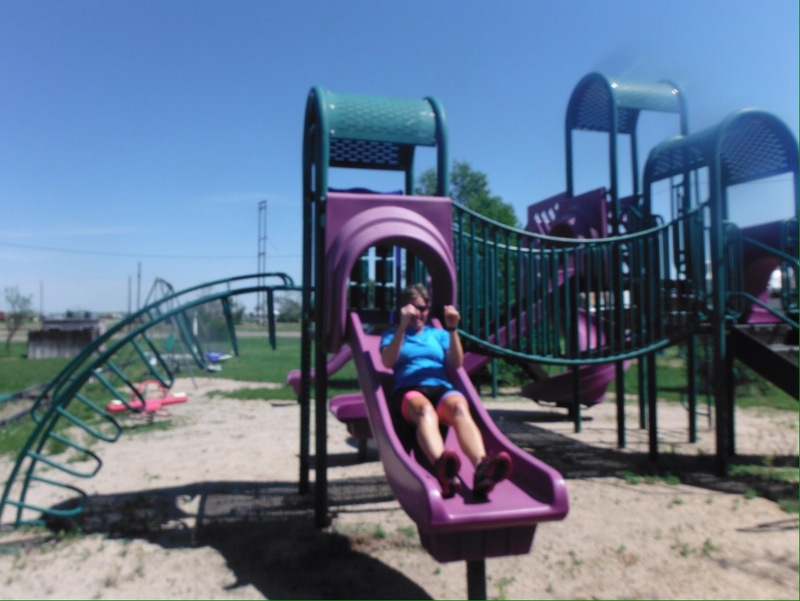 The heat had also been cranked up a few notches, to the point where sweat dripped from various bodily locations for the first time. The scenery opened out and we could see for miles and miles. I’m not sure where the mid-west officially starts but life felt different in more than one way from this point on. Day 1 highlights (or lowlights, everyone is entitled to their own interpretation) included a large spaceman holding a large fish; burgers and milkshake in a diner that had comedy mirrors and more Elvis memorabilia than you think could fit in one building; a small jail; a restored train dining car; and a couple of restored gas stations where the women who worked there could not have been more different in their welcome. First up was a Route 66 enthusiast who complemented Debs on her shorts (yes they are Lycra) more than once, and then when she insisted on taking a photo of both of us in an old car only managed to turn the camera off rather than take a photo, despite having very clear instructions to press the large button to shoot. We took the first opportunity to escape (after at least 20 minutes) without even making use of the toilet. Further down the road her oppositional counterpart barely looked up when we entered, and definitely did not have any drinking water for us. 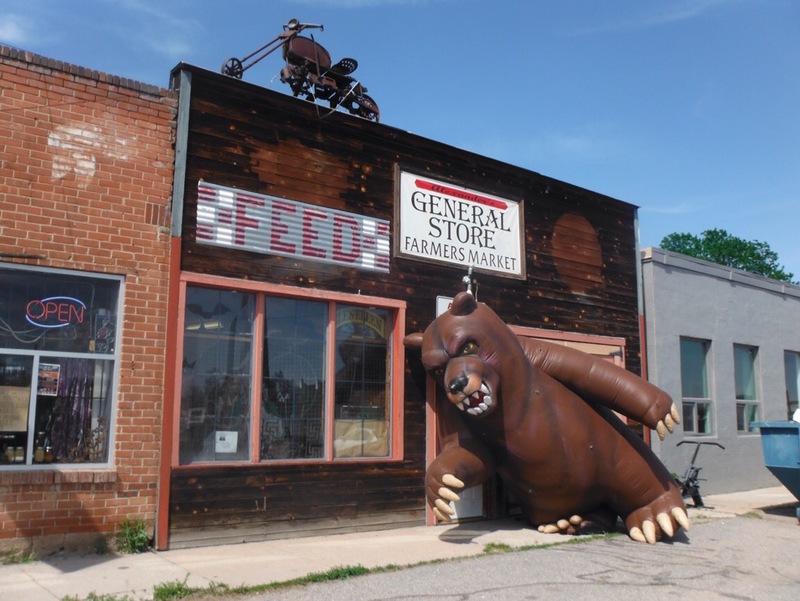 Pick your Route 66 attractions carefully. 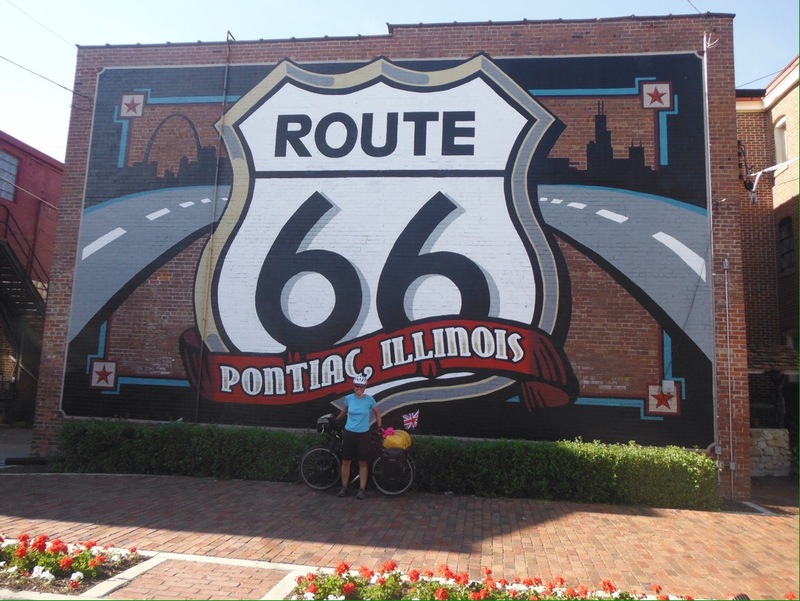 Our final stop of the day was Pontiac, home of many Route 66 murals (including the largest one in Illinois) and a museum that couldn’t have fitted more old stuff in. The main attraction is a VW van owned by Bob Waldmore, a guy who spent most of his life driving Route 66. Such was his iconic status that the makers of Disney Pixar’s “Cars” modelled the character Filmore on him, and initially wanted to name the character Waldmore. The museum has some interesting letters between Bob and Pixar as to explain why this didn’t actually happen. It’s a good story, google it. It was so hot outside we sat in the museum foyer and ate sweaty cheese sandwiches until they closed. That night we ended up between campsites and were saved by an invitation by a friendly family to sleep in a their trailer (caravan to the Brits). The final day riding into St Louis was a short one at only 45 miles but we still made it take all day by stopping for a long bakery breakfast on the way. 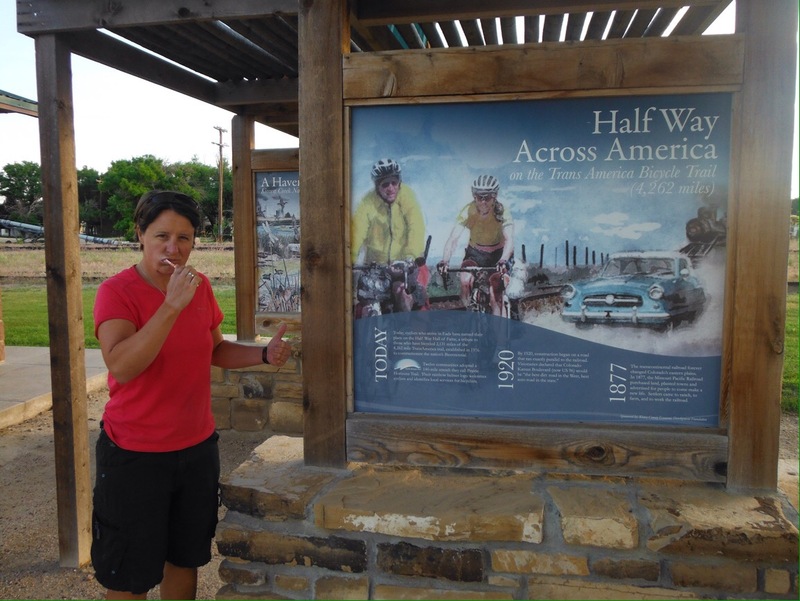 As we got closer to the end point of our Route 66 adventure, the attractions dried up and we switched to Lewis and Clarke information, the explorers who set out from Missouri to ‘discover and claim the West for America’. 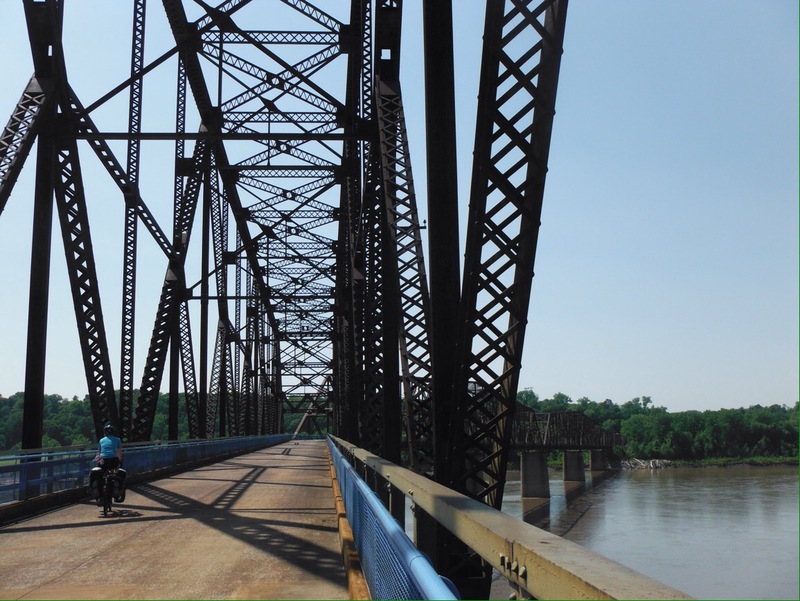 We crossed the mighty Mississippi River into Missouri on the old chain of rocks bridge, now closed to cars and famous for having a 22 degree bend in the middle. It had got really hot, and it was hard to believe that just seven days (and 500 miles) previously we had been sat watching it snow from a window in Michigan. 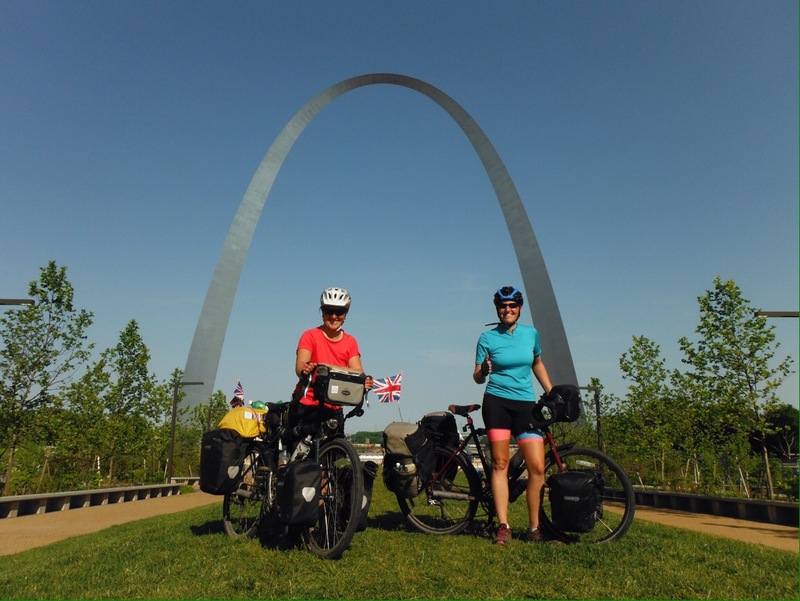 We would follow the Lewis and Clarke route for a few days out of St Louis but first we had to explore the city. Doug and Marta our amazing warm showers hosts met us at the Gateway Arch (gateway to the West of course) and took us on a bike tour of the city. 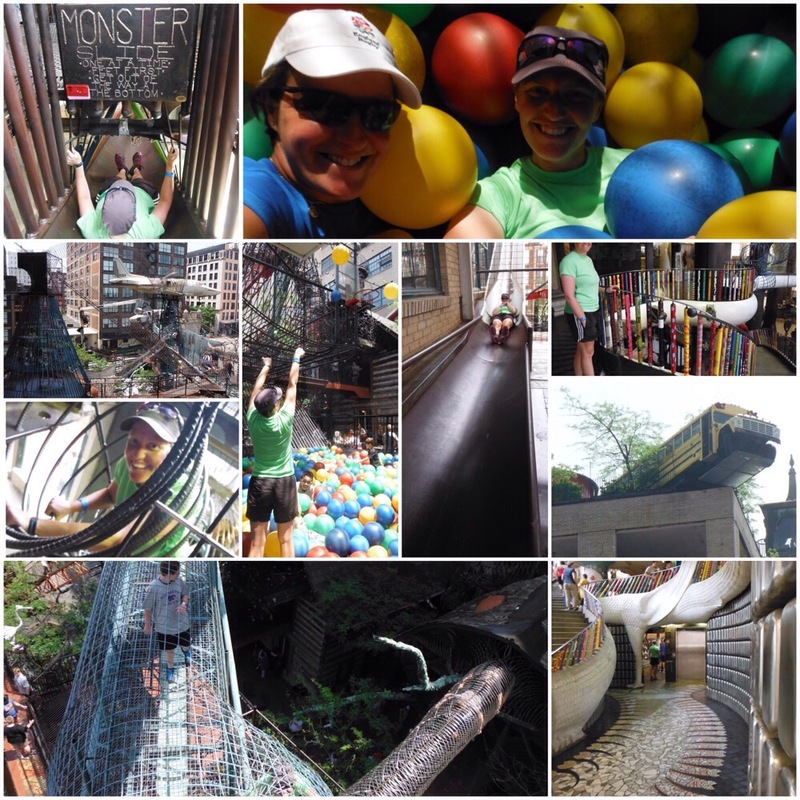 The next day was the most tiring rest day imaginable as we went to the St Louis City Museum. This place bears little resemblance to a museum but is more accurately a huge adventure playground for adults and kids, with pretty much everything made from salvaged material. There’s an old FBI plane to climb through, a school bus perched on the roof top, a large ball-pit, underground caves and mazes of climbing frames made from old industrial factory cast-offs. We spent four hours hauling ourselves through small holes and climbing over things (including small children), to the detriment of our arms the following day. It’s a very cool place. But it’s not a museum. And It’s definitely not a rest day activity. 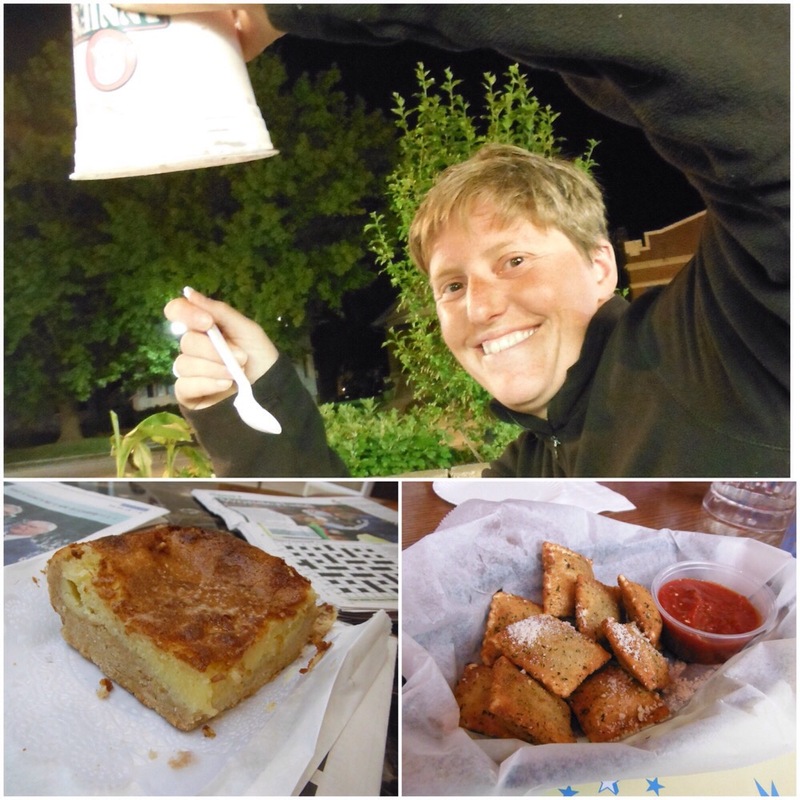 Before leaving St Louis we just about had time to try some local delicacies. On the way we had already experienced concrete, a frozen yoghurt that does not move when you turn it upside down. Second up was gooey butter cake, a cake that was very gooey and buttery. Finally we went out to Blueberry Hill, a very cool place where Chuck Berry still plays once a month, for burgers. Yes these are everywhere but as a side order we tried deep fried ravioli – though it’s called toasted ravioli for some reason. I prefer it’s abbreviation of T-Rav. Sounds much cooler. And it tastes ok too. Big thanks to Neil; Theresa and family; Tom, Martha, Alex and the rest of the family; and Doug, Marta and friends.